Miss Gabrielle Ray, the charming dancer and singer of Mr. George Edwardes companies, is engaged to Mr, Eric Loder, son of Mr. Alfred Loder, and grandson of the late Sir Loder, first baronet. Both the young people have modestly confirmed the announcement. The proposal was made and accepted in Paris. Mr Loder, who looked very happy when interviewed, said he did not desire any fuss to be made. He is said to be very wealthy. One firm alone is said to have sold between 7,000,000 and 10,000,000 picture postcards of Miss Gabrielle Bay. She is in her 27th year, but does not look it, and made her stage debut the age of 10. An enthusiastic Frenchman, writing in the “Temps” a few days ago, described Miss Ray the prettiest actress on the English stage and the most beautiful woman in the United Kingdom. Miss Gabrielle Ray, the heroine of the first footlight romance of the year, is the favourite of a very large public in London. One of the prettiest and daintiest stars of the musical comedy stage, she has danced her way into all hearts in a score of successes. She shared the popularity of Miss Lily Elsie in “The Merry Widow” and “The Dollar Princess” at Daly’s Theatre, and made a great hit in “Peggy,” which ran at the Gaiety most of last year. Miss Ray has, however a wider claim to distinction than even her popularity in the theatre gives her. She is the most photographed stage beauty of the day, and when the picture postcard craze was at its height far outstripped all rivals as a postcard favourite. One firm of photographers alone stated to have sold over sever million postcards bearing her photograph during the past few years. The selfish man who is robbing London of yet another of its most popular actresses is Mr. Eric Loder, a grandson of Sir Robert Loder, Bart; and nephew of Mr. G. W. E. Loder, formerly M. P. for Brighton, and Major Eustace Loder, a well known personality on the Turf. He is an enthusiastic motorist, and is a popular figure at Brooklands. Engaged: Miss Gabrielle Ray and Mr. Eric Loder. Miss Gabrielle Ray needs no introduction to readers of the “Sketch”: she is one of the most photographed beauties of the musical-comedy stage. Her fiancé is the son of the late Mr. Alfred Loder, and nephew of Major Eustace Loder. Mr Eric Loder, son of Mr Alfred Loder, and nephew of Major Eustace Loder, has become engaged to Miss Gabrielle Ray, the musical comedy actress (says the Paris correspondent of the New York Herald). Mr Loder, who is staying at the Hotel Meurice, confirmed the news of his engagement. Miss Ray, when seen later, also smiling confirmed the news, but said she would prefer to make no statement for publication. Miss Ray is said to be the prettiest girl in England. Miss Ray is London’s daintiest dancer, “Fond of acting,” said the interviewer. “I’m just mad on it,” was the reply. She is even more attached to dancing. “I’ve got a big gramophone at home,” she says, “and when I’m alone I turn on the music – make it play any old thing – it does not matter what – and dance all to myself. Miss Ray is petite and slight, and bubbling over with good spirits. She never walks – she always dances along – even in private life. 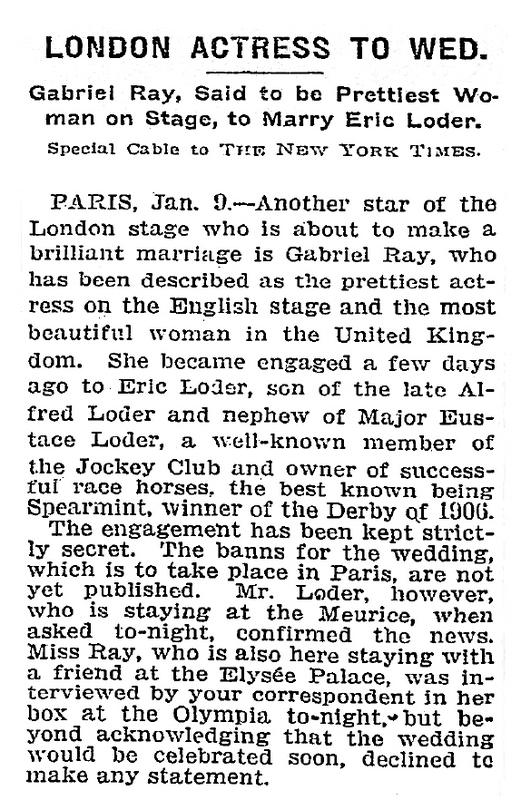 Gabrielle Ray, a Gaiety dancer, who was famous as Mamie Clancy in “The Belle of New York,” the “Post Card Queen,” of whom more than one million post cards with her picture have been sold, is engaged to Mr. Eric Loder, the famous automobilist, son of the late Sir Robert Loder. His brother, Basil Loder, married Barbara Dean, of Seymour Hicks’ “Gay Gordons” company, a few years ago. Miss Gabrielle Ray, the heroine of the first footlight romance of the year, is the favourite of a very large public in London. One of the prettiest and daintiest stars of the musical comedy stage, she has danced her way into the hearts in a score of successes. She shared the popularity of Miss Lily Elsie in “The Merry Widow” and “The Dollar Princess” at Daly’s Theatre, and made a great hit in “Peggy,” which ran at The Gaiety most of last year. 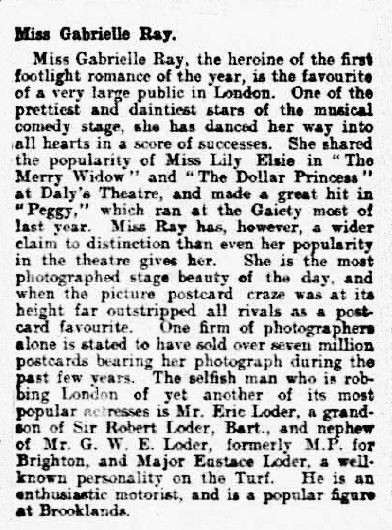 Miss Ray has, however, a wider claim to distinction than even her popularity in the theatre gives her. 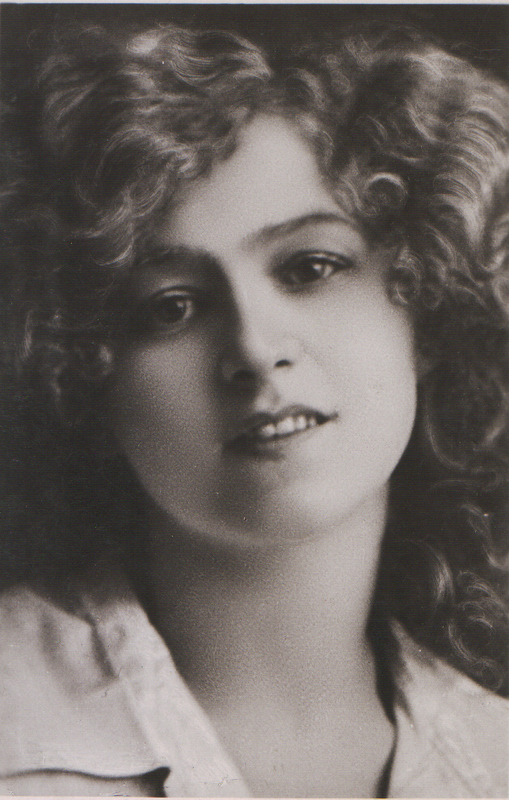 She is the most photographed stage beauty of the day, and when the picture postcard craze was at its height far outstripped all rivals as a postcard favourite. One firm of photographers alone stated to have sold over seven million postcards bearing her photograph during the past few years. The selfish man who is robbing London of yet another of its most popular actresses is Mr. Eric Loder, a grandson of Sir Robert Loder, Bart., and nephew of Mr. G. W. E. Loder, formerly M. P. for Brighton and Major Eustace Loder, a well known personality on the turf. He is an enthusiastic motorist, and is a popular figure at Brooklands. MISS GABRIELLE RAY IN FRENCH EYES. 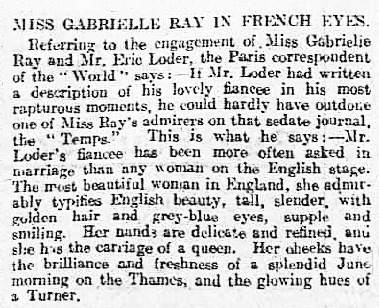 Referring to the engagement of Miss Gabrielle Ray and Mr. Eric Loder, the Paris correspondent of the “World” says: – If Mr. Loder had written description his lovely fiancée in his most rapturous moments, he could hardly have outdone one of Miss Ray’s admirers that sedate journal, the “Temps.” This is what he says: – Mr. Loder’s fiancée has been more often asked marriage than any woman on the English stage. The most beautiful woman in England, she admirably typifies English beauty, tall, slender, with golden hair and grey-blue eyes, supple and smiling. Her hands are delicate and refined, and she has the carriage of a queen. Her cheeks have the brilliance and freshness of a splendid June morning on the Thames, and the glowing hues of a Turner.